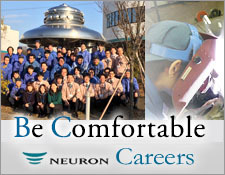 Contribution to Local Community/HSE | NEURON JAPAN Co., LTD. In all types of engineering, from familiar lifelines, to the energy development and space industries, our company uses the craftsmanship of tubemaking/forming/welding to manufactures a variety of different factoryequipment, including expansion joints which fulfill the role of the neural tube which joins pipelines.. At Neuron, we are aware of the influence these manufacturing activities have upon health, safety, and the environment, and we work hard to enable ourselves to manage the risk of personal injuries, health hazards, and environmental pollution, and lower and avoid these risks. We believe it is one of our company’s social responsibilities to save precious human lives by contributing to the lifesaving chain through the most important, prompt ,and unceasing measures. 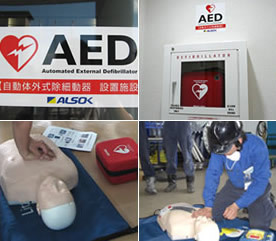 Naturally, all of our staff receive training in CPR procedures and AED usage methods, and are able to respond immediately. So that the visually-impaired are able to safely walk around outside, we have put in place two types of braille blocks for guidance from the site entrance to the building’s entrance, advising temporary stops and caution. 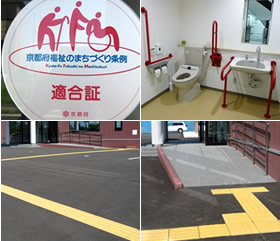 Additionally, the toilets on 1F of the Neuron Laboratory have been equipped with plenty of space and movable handrails, so that they can be used by the wheelchair-bound without worry. This sort of barrier-free facility is one factor which is given priority amongst many other considerations in the design of our company’s new facilities. These facts have been recognized, and we are now a company which complies with the “Kyoto Prefecture Welfare ‘Machizukuri’ Ordinance”. 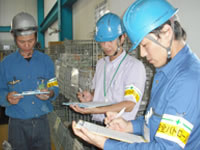 Early in the morning every Wednesday, machines within the factory are wiped down, and all staff work together in carrying out cleaning activities such as weeding the biotope and area around the facility. Not only does this make the area clean, but it also stamps out the effect rubbish has on the environment, and our company and all staff carry this while conscious of the fact that they are citizens of the localcommunity. In regard to advance initiatives relating to autonomous environmental conservation within management, our company has established these policies and objectives, and is striving to attain “Environmental Management (ISO14000)” in order to achieve these.